THE REVIEW: Fences is based on Pulitzer-winning playwright August Wilson’s play of the same name. The film was nominated for four Oscars last year, including a win for Viola Davis in Best Supporting Actress. 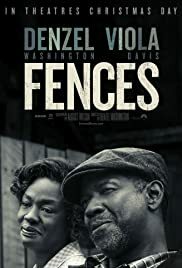 At the time, it was just one of two nominees for Best Picture I hadn’t seen (the other was Lion), and Fences was the one I had wanted to see the most, mainly for the performances by Davis and Denzel Washington. Regular readers will know by now that I am often not a fan of plays adapted into films. It may just be selection bias, since most films that fall into this category tend to be of the genre where the film is just the play recorded with cameras (though not on a stage). An adaptation should take the best of one medium, transfer it to another, and add the good parts from that medium. In my point-of-view, Fences nails this and is the quintessential example I will point to for plays adapted into films. Denzel Washington (in his directorial debut) is masterful in how he does this. The screenplay is obviously based off of a play — it is monologue heavy and location-lite — which would seem to be strike one. Part of the appeal of the film medium is its more conversational tone to develop characters over time. Yet despite monologue after monologue, that’s exactly what Washington does here; over the course of two-plus hours we live and breathe with the characters of Troy (Washington) and Rose Maxon (Davis), Troy’s two sons Cory (Jovan Adepo) and Lyons (Russell Hornsby), and Troy’s good friend Jim Bono (Stephen Henderson). We the viewer are just plopped right down in 1950s Pittsburgh and we become immersed. The dialogue is heavily one-sided, but it still feels conversational. We learn about and through these characters without it being exposition. The writing just is; it’s the perfect balance of “film-style” and “play-style” and knows the best parts of both media. Potential strike two is the acting. How, you say, is the acting a potential strike when the performances are widely recognized as outstanding? Traditional acting in film I would describe as subdued, at least in modern films. Since the camera can capture anything and everything, at whatever frame size you want, actors don’t need to be overly expressive — they can convey the emotions they want to in very subtle expressions, picked up on by close-ups and high-resolutions. On a stage in a large theater, actors need to be more outwardly expressive because you can’t see the person’s face from a balcony seat a hundred feet away. The performances in Fences air more on the expressive side, as if they were acting in a theater, but Washington again takes this pitch and turns it into a home-run. The acting is expressive because the characters are expressive. Troy Maxson is animated, dancing around the backyard and yelling for his wife as he walks up the street with Bono. It doesn’t feel out of place because it is who these characters are. Plus, there is also a tremendous deal of nuance to the performances. Without spoiling the context of the scene, I’ll just say I would have written down Viola Davis as my pick for Best Supporting Actress based on one look alone. A certain reveal happens and Davis’ reaction contains a thousand different expressions all at once - just thinking about it while writing this now is bringing back the memories from that scene. All-around, 100%, a deserved win for Davis, and phenomenal performances from the rest of the cast as well. Unfortunately I don’t have another topic to bring up as a potential strike three being converted to a home-run here - it goes along so nicely with Troy Maxson’s baseball analogy in the film itself. So I’ll end by saying, yeah, absolutely go see this film. I am blown away with how much I ended up enjoying this film, especially considering Fences seems from the outside to walk right along the edge of a good/bad film adaptation from a play. I’m actually surprised it wasn’t nominated for more awards than the four it received. Andrew Garfield ended up being my pick for Most Deserving in the Best Actor category, but I would probably amend that now to choose Washington instead - either way, Casey Affleck should not have been the one walking home with that trophy.